Many consumers prefer shower gel to solid body soap while in the shower. Shower gel base is easy to fragrance, color and bottle. Paired with a loofah or body sponge, shower gel is the perfect bath treat. Crafter's Choice™ Shower Gel - Crystal Clear - The best “all purpose” liquid wash. Upon use, it produces many slippery and creamy bubbles. It contains cocamidopropyl betaine which is thought to aid in antiseptic properties. Crafter's Choice™ Liquid Suspension Soap Base - The best suspension liquid wash. It is formulated with a combination of ingredients that suspend items that typically float and/or sink in liquid soap. Liquid Color - Liquid colors, such as liquid dye mix easily with shower gel base. Start with 1 mL per 16 oz. of shower gel and go up from there. Exfoliants - Exfoliants can be added to a shower gel base to make an exfoliating shower gel. Exfoliants range from jojoba beads to apricot seed powder. When using exfoliants dispersed in soap with pumps, be sure to test to make sure the exfoliant doesn’t clog the pump. Exfoliants can be added at 1/4 teaspoon per 16 oz. of base. More or less can be added based on your desired outcome. Fragrance Oils - Fragrance oils are synthetic man-made aromatic ingredients that are used to scent soap and other products. Some fragrance oils also contain natural essential oils. The typical usage rate is about 2% of the liquid soap base. Essential Oils - Essential oils are considered a natural way to fragrance soap and are concentrated hydrophobic liquids containing volatile aroma compounds from plants. Essential oils are extracted from plant materials (flowers, bark, seeds, peel, roots, leaves, etc.) by expression, steam distillation or solvent extraction. The typical usage rate is about 2% of the liquid soap base. Crafter's Choice™ FO & EO Modifier - Fragrance Oil & Essential Oil Modifier is a proprietary emulsifying agent that allows oil to dissolve with water. When used correctly, your end product will remain 100% clear. Thoroughly mix 4 parts FO Modifier to 1 part oil based FO. You have now created a new fragrance oil that will easily incorporate into water based products. Add 1% modified fragrance to water based products. Crafters Choice™ Polysorbate 20 - This allows fragrance and essential oils to bind with water-based products. Depending on your formula, your end product may be cloudy. Thoroughly mix 1 part polysorbate 20 with 1 part fragrance oil (equal parts) and add to the liquid soap base. Water - It is not recommended to add additional water to bases, as contamination can occur resulting in mold, bacteria or yeast growth. Perishable Liquids - It is not recommended to add liquid goat’s milk, fresh milk, beer, wine, fruit juice, vegetable juice or other perishable liquids as they will spoil the base. Too Much Additives - Adding over 5% of additives can render the preservative inactive resulting in mold, bacteria or yeast growth. Formulate your own shower gel recipe by using the percentages below as a guide. Once you have the base, incorporate additives at the percentages listed. Crystal Clear Shower Gel - 32 oz. Liquid Suspension Soap Base - 32 oz. Most bottles and tops are sold separately. This allows you to mix and match bottles with different tops to create a unique and specialized product. Note that different sized bottles also have different sized tops. Be sure to order the correct sized top. For example, a plastic bottle with "24/410" listed at the end of the product name will fit "24/410" tops. Plastic Bottles - There are numerous plastic bottles with different sizes, styles and colors that you can choose from to package shower gel. Pair these bottles with a disc top cap or saddle pump. Malibu Tottles - Shower gel can also be packaged in tottles especially for smaller travel sizes. Pair these with a flip top cap. Saddle Pumps - These tops allow customers to easily dispense shower gel and work nicely with plastic bottles. Disc Top Caps - These are popular tops for shower gel. Pushing on the top rocks half the top up revealing an opening. Gently squeeze the bottle upside-down to release some shower gel. Pushing the top back down creates a nice seal making these tops great for travel-sized shower gels! These work wonderful with plastic bottles. Flip Top Caps - Flip these tops open, and squeeze shower gel out. These tops work well with the malibu tottles, and are also convenient for travel-sized products. Shower gel bases accept additives such as fragrances and colors better if heated. It helps to emulsify them into the mix. Heat your base to 120°F. Heating to higher temperatures or heating for long periods of time will inactivate the preservative. Microwave - Weigh your base into Pyrex or other heat-safe container. Heat your base using 30-second increments until the temperature reaches 120°F. Be sure to stir often while heating to get rid of any hot spots. Overheating in the microwave can easily occur, so monitor closely. Double Boiler - The better method is to use a double boiler setup. 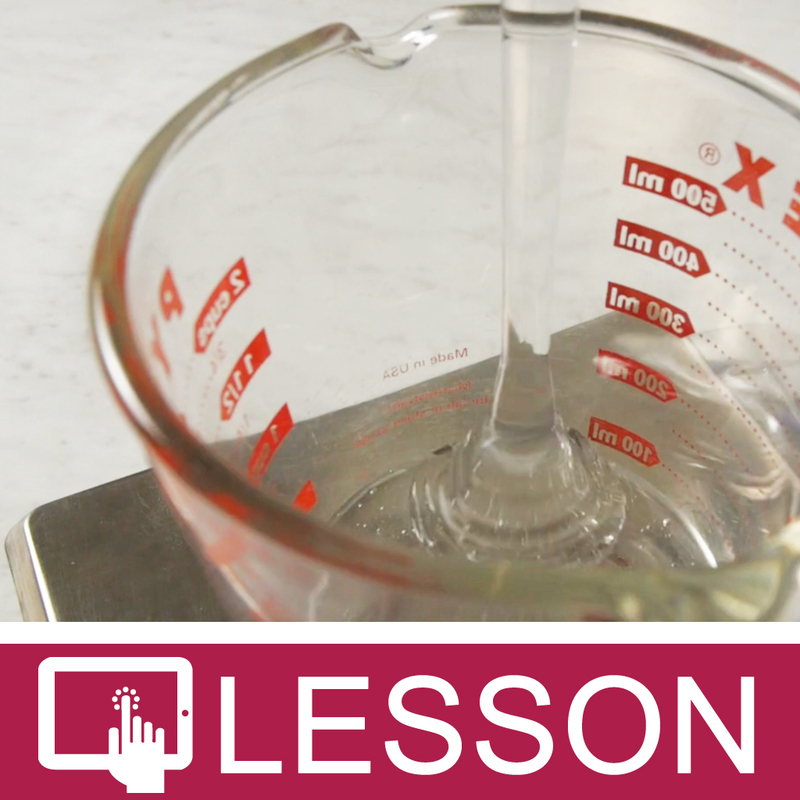 Weigh your base into a double boiler on low heat. Heat until the temperature reaches 120°F. Be sure to stir often and check the temperature as you heat. You can use an infrared thermometer to monitor temperaturess closely when heating. When taking the temperature, be sure to mix the base prior to checking the temperature as the infrared gun only takes surface temperatures. Add your additives, such as fragrance and color, to the heated soap and mix well to blend. Once your additives are fully incorporated, you can now bottle your shower gel. We recommend pouring slowly from a couple inches above the mouth of the bottle. For the malibu tottles, we recommend setting them in a measuring cup to keep them upright while filling. Do not cap your containers until the shower gel has completely cooled as this may create condensation in the bottle. Once completely cooled down, cap your containers.